Today I’m going to discuss a very important topic that will be affecting all businesses inside and outside the European Union (EU) that process personal data about EU citizens. Yes, I’m talking about the General Data Protection Regulation (GDPR) that is coming into effect on May 25, 2018. 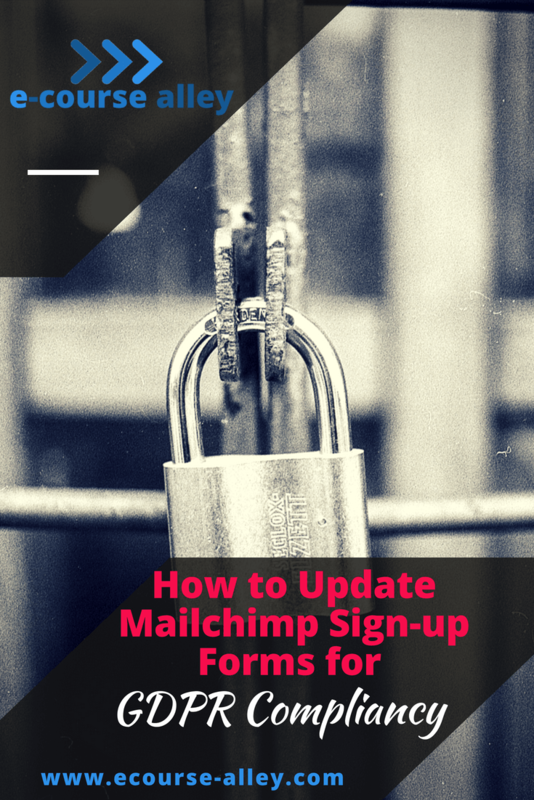 So, to help more people out with this, I’m going to show you how to update Mailchimp sign-up forms for GDPR compliancy. One reason I thought of doing a post on this and a video showing step-by-step how to update opt-in forms is because I noticed a lot of information popping up but not a lot of practical information showing what to actually do. Now, before we go any further, just a little disclaimer: I’m no expert in the General Data Protection Regulation, I’m simply showing you what we did at e-course alley to become compliant. So please consult legal counsel for accurate information and to find out how the GDPR affects you. Maybe you are thinking but does GDPR really affect me? I only have a newsletter that people subscribe to. Well, believe it or not even if you just collect email addresses through your Email Service Provider (ESP) for your blog, GDPR still applies to YOU! 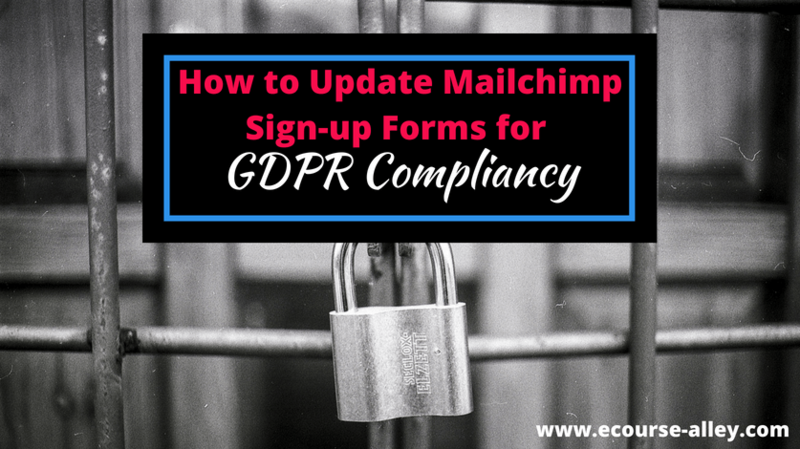 Now, instead of just typing out some of the steps we took to update our email marketing campaigns, I’ve chosen in this blog, to show you a video where I will take you through the process of how to update Mailchimp sign-up forms for GDPR compliancy. We are focusing on Mailchimp since this is our Email Service Provider at the moment, but it would be similar with other ESPs. The General Data Protection Regulation may seem a bit daunting at first, but it’s important to comply with this new regulation as the penalties can be steep. Once you’ve conducted your own research, be sure to follow the steps laid out by your ESP in order to update your forms, segment your list and collect consent from existing subscribers. Also, make sure you are ready by May 25th, 2018!! However, if you are still thinking you can just ignore the GDPR and it will go away and won’t affect you, think again. If you collect email addresses and promote your products and services, you should be compliant. It’s better to be safe than sorry, so the saying goes. One final thought that I’ll mention again, I’m not a GDPR expert, I’m just showing you what we did in practical terms to make sure we were complying with this new regulation. So, please seek a legal professional to find out how the GDPR will affect you and your business.